Story Time: Gather memories of your dear grandparents and a cup of tea if you will. 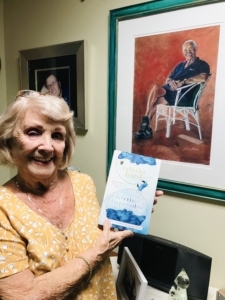 Yesterday my grandmother, affectionally known as Nannie, saw the ARC (advanced reader copy) of my book for the very first time. But let’s backtrack to a little girl and her Nannie. A wide-eyed child scared of many things but brave when she was at her grandmother’s house. I am Nannie’s eldest granddaughter and so I performed the magic of making her a grandmother and that has always been a most special magic between us. As a child, Nannie was my home. She was a place where chicken soup and thick bread with butter was served. A place where chocolate squares where given past bedtime along with giggles and kisses. A place where bedtime was whenever we both fell asleep in front of her old television in the living room tucked up under a knitted rug. She was my refuge from the biting winds and chaos of my own house. And I can’t begin to explain how important that was. To be loved for no other reason than the fact the you exist. When you come from a house where there is violence to a place where there is gentleness you cling as if it were your world. And to Nannie I was the world. To her I was always enough. Always beautiful. Always wanted. To a child with a whale-sized imagination, yet very little idea that she was loveable, my grandmother was everything. Every good thing. From her love I spread my wings. At her place I told stories and ran through gardens and played dollies with my sister. She bought me red shoes because my brown pair that I had to wear because my feet had fallen arches made me feel ugly. She told me braces were only for a season and that I was beautiful no matter what. She made me believe I could do whatever I wanted. Go to uni. Get married. Be a good mother. And write. “Of course you will be the best writer ever there was,” she said. Because to her I already was. Later, it was my Nannie who sent me a congratulations card when my very first poem was published. It was my Nannie celebrated like I’d won the Miles Franklin Literary Award when my first little article when to print. Many years on, when I told her I had an offer of publication on the book I had been working on for so long, she cried big, happy, blubbery tears over the phone as if it were the best day of her life. Every step of this journey to publication she has swooned over every part of my news. Wanted to know all the details. Sent her love and belief. Told me I would nail those edits. Rang me before my first meeting with Penguin Random House in Sydney. Told me of course I would be fine. Of course they would like me. How could they not? Then yesterday… I walked into the living room with my Nannie clutching my book. I gently placed it on her lap and waited. She picked up my book like I’d brought my first-born child home. She rocked it, held it close to her chest. And then she took my hand and lead me into the dining room where she has a painting of my dearly departed grandfather, William, and she held up my book to him. Oh, folks. I do wish I could have caught that moment on video on my phone. But instead, I lived it. I soaked it in to all the dry places, any parts of me that still doubt and have trouble with self-belief. And simply stood beside my teary Nannie and hugged her while my grandfather watched. And I am sure he was watching. I hope he was smiling. Both my grandparents (among many others in my life) deserve this book more than I can say.